An ancient urn believed to date back around 3,000 years has been discovered in the southern Turkish province of Kahramanmaraş. 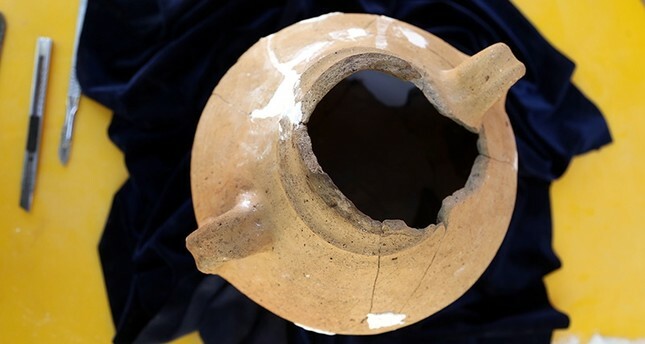 A team of archeologists unearthed the urn -- where the ashes of the deceased have apparently been placed -- in the Karahüyük region of the Elbistan district as part of excavation works ongoing since 2015. People living during the Iron Age preferred to bury the deceased in the places where they lived, Bora Uysal, an academic from the Archeology Department at Cumhuriyet University, told Anadolu Agency. Uysal has been carrying out the excavation works in Karahüyük ​for three years. "Instead of inhumation, cremation was being preferred. Burnt human bones, along with ashes were put in pots called 'urn.' They were placed in hills in this way. It dates back 3,000 years from today," Uysal said. This is the second cremation cemetery discovered in Anatolia. The first one, from the late Hittite era, is located in southeastern Gaziantep province, according to the academic.